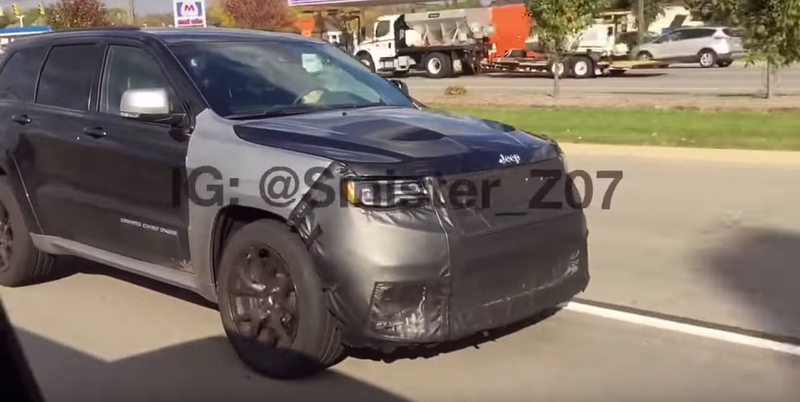 Is This The Hellcat Jeep Trackhawk Or Is That Just Wind Noise? Here we see a scooped, caged Jeep Grand Cherokee rolling on manufacturer plates down some Detroit area byway. It’s definitely something, but is that supercharger whine or just wind noise I hear? That’s sort of the critical question. We’ve gotten confirmation that Jeep is going to stuff their 707-horsepower supercharged V8 in the Jeep Grand Cherokee next year. It’s a canny move; while Mercedes and Volvo and everybody else in the automotive industry are pouring gobs and gobs of cash into increasingly esoteric technologies and user interfaces that buyers don’t even know they want (ooh! this rear-view mirror can turn into a TV screen! ), Chrysler knows they can jam a supercharger on a V8 and make more headlines on the cheap. Hellcat all the cars, I say. Anyway, it’s not clear that we can hear that oh-so-critical supercharger on this particular ‘development mule,’ or if it’s just the whoosh of wind rushing past an open window. Even if this isn’t a Trackhawk, it’s still impossibly cool to see on the road.